The quality of the traditional wool 16 ounce Kilt is most noticeable in the rear pleating. 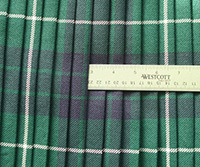 A quality wool Kilt will have deep pleats. Notice that the pleats in the Kilt to the right are 3 inches deep! The pleating lays flat and holds quite nicely even after sitting in the Kilt. The pleating quality also contributes to the sway of the Kilt. The traditional Kilt has a nice sway to it when walking. If you are a fan of Harry Lauder, the Scottish vaudeville singer of the 1920s, you surely have heard about the “wiggle, waggle of the Kilt". This sway is an important quality of the Kilt. The Sett is the pattern of colors or lines which are repeated in the Tartan. 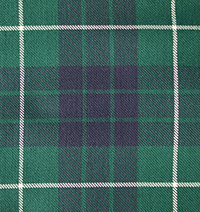 Pleating to the sett allows the full pattern, or Sett, of the Tartan to show completely in the rear pleating. The images to the right show Pleating to the Sett. The sett, with the outer white stripe and the inner blue and green pattern, is clearly repeated throughout the rear pleating. 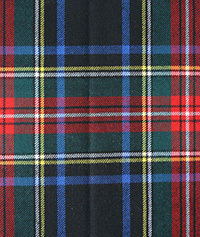 Pleating to the stripe, also known as Military Pleating, does not show the full pattern and emphasizes the stripe in the Tartan. Compare the images shown below of Pleating to the Stripe. On the left, is the Black Stewart sett which has a black background with large red stripes and smaller blue, white and yellow stripes. To the right is that same tartan pleated to the red stripe giving a very different appearance. Both pleating options are very nice and it is a matter of personal preference. 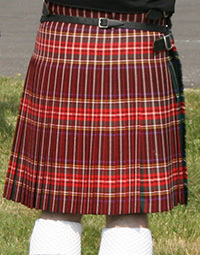 Most Kilt makers will Pleat to the Sett unless otherwise specified. So if want your Kilt Pleated to the Stripe, you likely will need to specifically request that style.